Using Webhook you can receive the JSON from your Mackerel alerts with POST. This will be handy for those users who want to automate processes that occur after notifications are received. Notification settings can be added and configured Webhook form in the Channels Page. Here you will need to designate the URL that will receive POSTs from Mackerel’s servers. metricLabel string title of the monitoring target’s metrics etc. ※Alert information items fluctuate depending on the type of monitoring target (host metrics, service metrics, external monitoring, expression monitoring) and each configuration item. For example, if only the URL is configured with external monitoring, information for metrics, thresholds, etc. will not be included. The type of monitoring target and the output items correspond with possible input items from the monitoring configurations screen. 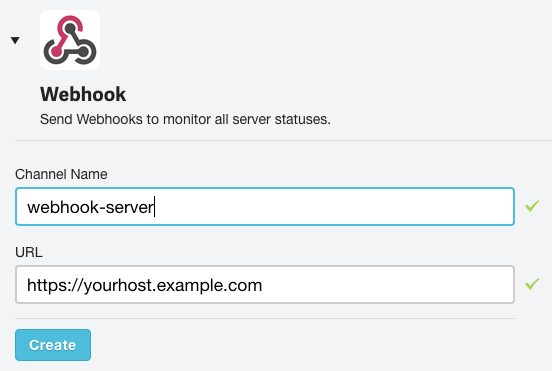 For security purposes, we recommend taking the following measures when using Webhook. For infomation of the IP address range of request origins of notifications from Mackerel, check our FAQ page.